GUIDE OF THE SUBWAY IN PARIS : ADVICES AND EXPLANATIONS FOR “HOW TO USE THE PARISIAN METRO” ? You are just a while in Paris, or in quest of Parisian tourist activities, wondering how to visit the city and where to start? Quickly discover the 14 metro lines in Paris ranging from the one that proposes the most monuments on its way to the one which proposes the least. It starts (or ends) at La Défense, the heart of French business district, goes through the station Charles de Gaulle Etoile, where is the Arc de Triomphe, then crosses the Champs Elysées, Place Concorde, Le Louvre and Châtelet where is located the Pompidou Center (Paris Museum of Modern Art), the City Hall. Line 1 is the first line of the French Metro. Inaugurated on July 19, 1890. It is historically the oldest one, but it is especially the metro line which links the most Parisian monuments on its way! Line 4 starts from the Porte de Clignancourt, goes through the Château Rouge stations, which is the station near the Sacré Coeur on the Butte Montmartre, Châtelet, Cité to access the Island of the La Cité, the square encircled between the Pont Neuf and Pont Marie is a romantic and recommended place to be amazed by the sunset in Paris, St-Michel where Notre Dame de Paris is situated, Saint Germain des Prés and Montparnasse and its grand tower. Crossing through the middle of the capital from north to south, the line 4 exists since more than a century. It is the only metro line in Paris that has a connection with all the other lines, whether the metro or the RER. It's the second busiest line after line 1. Metro line 7 passes by the stops of Place d'Italie near the Asian district, the Pont Marie, Chatelet, the Pont Neuf, the Louvre, the Opera (Opera Garnier) and by the Galeries la Fayette. This subway Line 7 runs through Paris from north-east to south-east. With the Line 9 you have the access through the Trocadéro monument stations, Alma Marceau (Bridge of the Alma), Franklin D. Roosevelt (on the Champs Elysées), Chaussée d'Antin La Fayette, Republique near the Canal Saint-Martin, and Nation. The Line 9 is one of the longest and busiest lines of the Parisian metro. It runs from the southern suburbs to the West of Paris and is thus fourth position of all RATP (Régie Autonome des Transports Parisiens) metro lines. Line 13 goes through important stations, especially for tourists, such as Montparnasse Bienvenüe, Invalides, Champs Elysees Clemenceau, Saint Lazare, Place de Clichy and the Basilica of Saint Denis. It is the longest line in Parisian subway network. It is connecting the northeast and northwest suburbs to the south of Paris by 24.3 kilometers long railway. With a capacity of 600,000 persons of public transportation a day, the Line 13 is one of the most used one by Parisians. Line 14 will drop you off at the main stations of Saint-Lazare, Madeleine, Pyramides, Châtelet, Cour St Emilion and Bibliothèque François Mitterrand. It is the only subway line that functions fully automatic without driver. This line is the last one added to the Parisian metro network. It crosses the central Paris diagonally from north-west to the south-east. The Line 12 reaches from the north to the southwest of the Paris by running the main stations such as Montparnasse Bienvenüe, Rue du Bac, National Assembly, Concorde, Madeleine, Saint Lazare, Pigalle and Abbesses the Metro station in the heart of the very popular district of Montmartre. Line 8 will bring you to Bastille, République, Opéra, Madeleine, Concorde and Invalides. It runs only to the south part of Paris from west side to the east. This line is the first to cross the Paris peripheral road to join one of the new departments of Ile de France towards the capital. Line 5 goes mainly through the Place d'Italie metro stations, Bastille and Republic. It is one of the oldest metro stations in Paris. It runs the East Zone from Paris. Line 2 was Opened in 1903 and serves on stations by its 12.4 kilometers long railway; Nation, Père Lachaise and its famous cemetery, Anvers, ideal station to visit the Sacre Coeur and the Montmartre Hill, Pigalle, station of the famous Moulin Rouge, and Charles de Gaulle Etoile with his well-known Arc de Triomphe. Secondly opened line in the capital on a semicircular path to the north of the city. Line 6 goes through the Charles de Gaulle Étoile (Arc de Triomphe) stations, Trocadero, Bir Hakeim - Champs de Mars (Eiffel Tower), Gare Montparnasse and Nation. As the line 2 above, the line 6 has a semicircular path too, but this time it’s on south of Paris. It has a particular specialty of having 45% of its railway higher than ground, and this will offer you a breathtaking view of the Eiffel Tower while its passing over the Seine between Passy and Bir Hakeim stations. Line 3 crosses the stations Saint Lazare, Opera, Bourse, Republique and Père Lachaise (largest cemetery in Paris). It connects the nearby west suburbs (Levallois) to the east of Paris. This is a very busy line, especially since it is crossing the neighborhoods of Saint Lazare, Grands Magasins, Opera, Levallois and Bourse central business district. 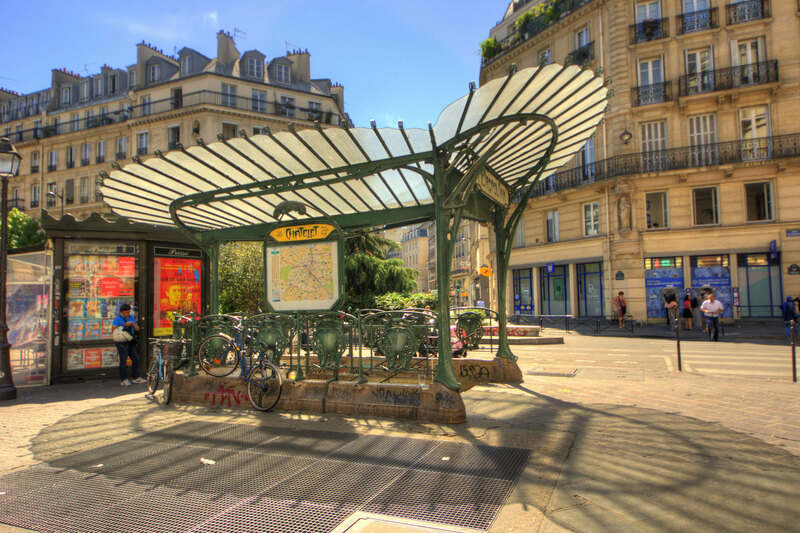 The only major stations that line 10 crosses are Gare d'Austerlitz, Odeon (Saint Germain des Prés), Cluny La Sorbonne (Latin Quarter) and Sèvres-Babylone with its famous Bon Marché. Line 10 is the one that has seen its route vary most often during its history. It was ex-line 7, 8, 13 and also one of the lines better illuminated being entirely painted in white. It crosses the left bank of the Seine on the southern half of Paris. Châtelet, Hôtel de Ville and Republique are the only important stations of the Metro Line 11. It connects the center of Paris to the near north-east suburbs (Saint Denis). This is one of the last lines that began to serve by replacing the Belleville funicular tramway line disassembled on 1924. Please have a look www.pariscitytours.fr if you have any plannings to visit Paris with the best prices and many more detailed information.